4 Bedroom Detached House For Sale in Glasgow for Offers Over £255,000. Stylish, extended four bedroom detached villa, beautifully appointed throughout and offering open views to the rear. Formed over two levels, the accommodation comprises good sized lounge, open plan to dining area and extended kitchen. The dining area has French doors to the rear decking and garden and modern fitted kitchen provides a breakfast Island and has a utility room off. There is a second public room on the ground floor with an en suite shower room - alternatively bedroom 5. On the upper level, there are four double bedrooms with fitted wardrobes and the master suite has an en suite shower room. building and to the front of the property there is a monoblocked driveway. 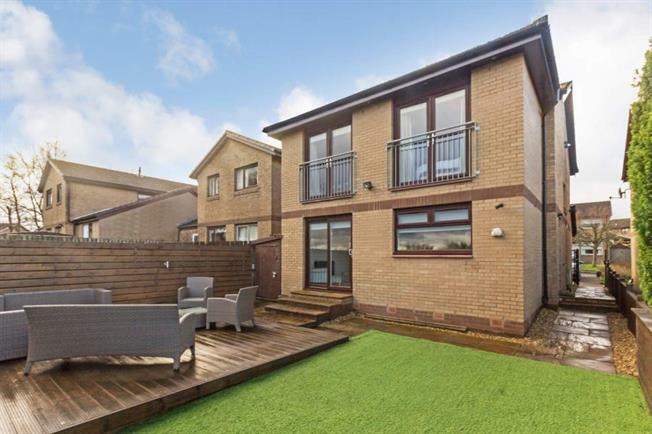 There are transport links to Glasgow and the surrounding area, this property is also ideally located to access the local motorway networks M8 and M74. Please refer to published Home Report for EER Band.